A 35-year-old man was charged with murder yesterday for allegedly clubbing his wife to death after falsely accusing her of having an affair. 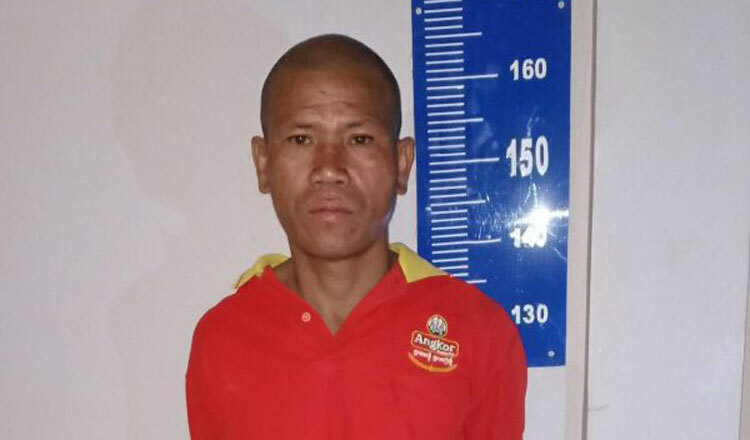 Kampong Cham Provincial Court charged farmer Chrech Dorn of Cheyo commune over the death of Chorn Tha, 38. Ms Tha died of severe injuries on a bed under her house in Kampong Cham province’s Chamkar Loeu district. Lieutenant Colonel Pen Teang Chamroeun, chief of Chamkar Loeu district police, said Mr Dorn was charged with intentional murder and faces up to 15 years in jail if convicted. Mr Dorn was arrested on Saturday and has been sent to prison in the province pending the trial. Lt Col Teang Chamroeun said that before the murder, at about 7pm on Saturday, the accused drank a litre of rice wine at his home in Cheyo commune. He got drunk and got into an argument with his wife. Mr Dorn was often jealous of his wife and accused her of having an affair with a man in the village. Ms Tha always denied an affair but her husband did not believe her. He told her to confess her love for the man but she did not because she did not have a relationship with him. “He broke her skull and she died instantly on the bed,” he added. Mr Dorn fled but he was arrested by communal police in Cheyo commune at about 10pm. After his arrest, police seized a big piece of wood from him. Lt Col Teang Chamroeun said police had received a report about the murder from Khuth Phon, 77, the mother of the victim. Captain Muong Mongdy, chief of the Cheyo commune police, said the accused admitted committing the offence when he was questioned.